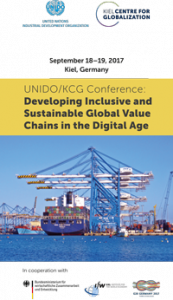 The UNIDO/KCG Conference “Developing Inclusive and Sustainable Global Value Chains in the Digital Age” is jointly organized by the Kiel Centre for Globalization (KCG) at the Kiel Institute for the World Economy and the United Nations Industrial Development Organization (UNIDO). It builds on the Vienna Investment Conference: Quality FDI, Growth and Development which was jointly organized by UNIDO and the Kiel Institute for the World Economy and held in September 2016 in Vienna. The Conference will take place on September 18-19, 2017 in Kiel, Germany. 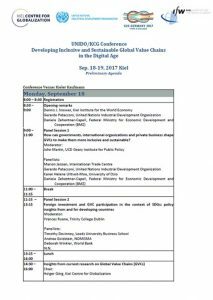 It aims at bringing together academics, policy makers, representatives from international organizations and businesses to discuss the challenges and opportunities – and the possible future – of the proliferation of global value chains (GVCs). The focus is on how to make the most of global production sharing in the digital age and to ensure that GVCs are shaped in such a way as to foster “inclusive” and “sustainable” development of all countries involved. The overarching theme of the Conference reflects the interests of the G20 during the Germany’s Presidency in 2017, where issues on how to achieve strong, sustainable and balanced growth; free and fair trade and globalization; and issues concerning the spread of digital technologies are high on the agenda. The Conference will be organized under the auspices of the Think 20 network. Think 20 (T20) is an engagement group of G20 and it is co-chaired by the Kiel Institute for the World Economy in 2017. The Conference is particularly linked to the T20 Task Force on “Trade and Investment”. Linking in with the T20 network allows both the KCG and the UNIDO to signal to the G20 their interest and expertise on these topics, and to provide research-based policy inputs into the ongoing debates among the G20 countries. The Conference is planned as an event of one and a half days. On the first day we will have a research-based presentation session “Insights from Current Research on GVCs” involving high profile academic experts in the area. This will be followed by four plenary sessions (two on the first day and the other two on the second day) focusing on policy issues and solutions to deal with challenges faced on the way towards more inclusive and sustainable GVCs. How can governments, international organizations and private business shape GVCs to make them more inclusive and sustainable? How can digital technologies contribute to the development of inclusive and sustainable GVCs? After Entering the password and clicking on “Download” the data transfer starts. after about 10 seconds.